Baseball is played just about every day. You get the season package on your TV or streaming device, you want to follow your players, you want to settle in and enjoy. But how can we get any peace when the starting pitchers keep getting hammered? There’s obviously blood in the streets. Homers are through the roof. MLB’s cumulative ERA stands at 4.40, which is even higher than the Home Run Derby year of 2017. The median ERA in the Friends and Family League currently stands at 4.19, and it’s likely to get higher when the weather truly warms up. Every day I get asked what’s wrong with Chris Sale, or Aaron Nola, or Corey Kluber, or Carlos Carrasco, or James Paxton, or Stephen Strasburg. I don’t have any especially satisfying answers. But we have to do something. Let’s see what’s available to us. Maybe the AL Central is a fairly safe haven. We were pounding that theme all spring, and so far it’s been reasonably true. The Twins are seventh in OPS, the Royals 17th, the White Sox 19th. And it’s been especially smooth against the Indians (27th) and Tigers (28th). Maybe it’s as simple as trying to find teams that can’t score much; can’t reach the seats often. The Tigers have a putrid 40 runs scored (last) and seven home runs (last). San Francisco is 28th in scoring, Miami is 29th — and both of those teams play in pitcher-cushioning parks. Colorado is going to mash at home, eventually, but thus far it’s been a road-heavy schedule and a messy .204/.262/.325 slash. The Rockies at standard elevation scare no one. We’re deep enough into the season where wipeout relievers become targets of choice, no matter if the pitchers were unheralded before the year. Check in with the Reds, where Raisel Iglesias is fresh off another blown save. 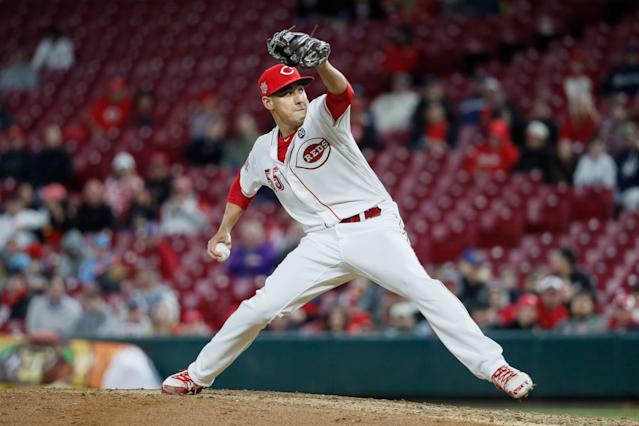 Maybe Robert Stephenson (9.1 IP, 3 H, 1 ER, 1 BB, 12 K) can work into some high-leverage work. Heck, I want guys like that just for the ratio relief. Miami’s Nick Anderson has been on my radar for a while. He put things together in Triple-A last year, and thus far with the Marlins he’s been a lawnmower: 7.2 IP, 7 H, 1 R, 2 BB, 16 K. When the K/BB ratio is that electric, I’m willing to make a move despite a small sample. Relievers are constantly inventing and reinventing themselves, and dominators often come out of nowhere. Ryan Pressly, surprisingly, trades at just 31 percent of Yahoo leagues. The Astros have guessed right, or worked their voodoo magic, with so many pitchers in recent years. Pressly hasn’t allowed a run yet, the WHIP is a silly 0.39, the strikeouts line up. He has a win and a save. Approved for all audiences. Oakland’s bullpen is usually a good place to shop. Lou Trivino (1.64/0.64) is a known commodity, and the strikeouts are over one per inning. J.B. Wendelken is getting work as a multi-inning reliever (3.64 ERA but a 0.81 WHIP, 14 whiffs in 12.1 innings). These guys are the affordable Astros; many relief pitchers have found their best form in Oakland, and a roomy park will hide some of the mistakes. And if it’s on the infield, Matt Chapman and Marcus Semien can probably turn it into an out. It works both ways, of course. Jeurys Familia was a mess Monday and is up to a 6.48 ERA, 2.16 WHIP. He’s walked nine men in 8.1 innings, given up a couple of homers. Maybe he’ll be fixed eventually, but I’m not going to wait around for it. I dropped him in one of my leagues Monday night, without a corresponding add at that. Sometimes a therapeutic cut is what you need. Maybe Trevor Hildenberger doesn’t belong on this non-closing list, after Sunday’s save.But also note the nine strikeouts (against one walk) over 5.1 innings. Minnesota’s bullpen is a wide-open affair. The key for Hildy is keeping the ball in the park, as last year’s 12 home runs are too many for our purposes. But I had no problem making him a proactive target with my Sunday bids. His Monday debut against Cincinnati was smooth — other than a two-run Yasiel Puig homer, he was unscathed through seven innings (5 H, 2 R, 0 BB, 6 K). The fastball was ordinary but the slider was sharp, and heck, the fastball is becoming the pitch of death these days, anyway. More than ever before, you need to try to keep the ball out of play. Bad things happen when batters make contact. Atlanta has a slew of starting pitching options, to the point that sometimes it’s hard to keep track of them all. Touki Toussaint was lights out in his seasonal debut (six scoreless, seven strikeouts) and has a rotation spot for now. A home turn against Arizona looks reasonable. TT was quickly chased to 50 percent in Yahoo over the last couple of days. Generally I am a Trevor Cahill defender, at least when he’s healthy. But you can’t expose him to a place like Arlington. The heat is always a problem there, not to mention the jet stream to right field. Cahill muddled through four Monday innings (four runs, two homers), then hit the showers. The Mariners aren’t an easy weekend draw, but at least it’s in the more reasonable Anaheim ballpark.